An unflinching story of a troubled friendship — and one girl's struggle to come to terms with secrets and shame and find her own power to heal (age 14 and up).Leah Greene is dead. For Laine, knowing what really happened and the awful feeling that she is, in some way, responsible set her on a journey of painful self-discovery. Yes, she wished for this. She hated Leah that much. Hated her for all the times in the closet, when Leah made her do those things. They were just practicing, Leah said. But why did Leah choose her? Was she special, or just easy to control? And why didn't Laine make it stop sooner? In the aftermath of the tragedy, Laine is left to explore the devastating lessons Leah taught her, find some meaning in them, and decide whether she can forgive Leah and, ultimately, herself. 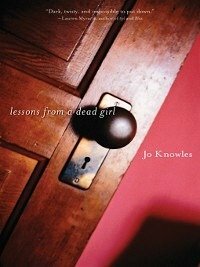 Jo Knowles says the inspiration for LESSONS FROM A DEAD GIRL came from an article she read about kids abusing kids. "I began to wonder what makes childhood friendships so complex, so painful at times, and yet so binding," she says. The recipient of the 2005 PEN New England Children's Book Discovery Award, Jo Knowles lives in Vermont.